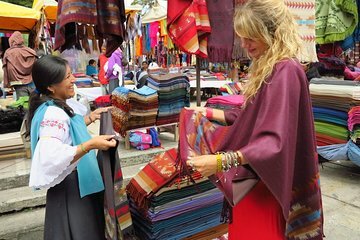 Compre souvenires exclusivos em um mercado indígena e desfrute da maravilhosa paisagem durante esta viagem de 8 horas de Quito para Otavalo. Este fascinante mercado apresenta uma grande variedade de artefatos produzidos por comunidades andinas locais, incluindo produtos têxteis, de couro e muito mais. Aproveite a sublime vista da cordilheira dos Andes e do Lago San Pablo durante sua viagem para o local antes de ir atrás de souvenires. No caminho de volta, você pode escolher entre visitar Cotacachi, uma cidade famosa por seus produtos de couro, ou o Lago Cuicocha. Sua viagem de compras e paisagem inclui um guia, taxas de entrada, um lanche, viagem de ida e volta do hotel e um upgrade com almoço. The maket was really nice, we bought some nice souvenirs. A great private tour with Alfonso. Very knowledgeable spoke great English. Took us to the flower market, Panama hat shop and for Bischocos. Fantastic included lunch, paid extra to get Cuy, don’t be afraid it’s GOOD! Very happy with tour, guild went above and beyond. Great indigenous market place too. Fun day trip out of the city. Guide was knowledgeable, engaging, and fluent in english. the market itself is small and the stalls have pretty much the same stuff, so you don't really need to linger there long. Also, it's better with a private tour as you don't have to wait for dozens of other people to finish up shopping when you've been done for a while. Great tour. It is worth paying the extra to have the private tour although we did have 1 extra guest. Raul spoke fluent English and was very knowledgeable. The tour did start very late due to the traffic. Our guide, Alfonso, spoke magnificent English and was very knowledgeable about the area and it's people and customs. He also took a side route to take us to the equator when he learned that we would not have time to visit there. Latin Adventures went above and beyond to return a cell phone that was left in the car at the end of the tour. It was waiting for us at a hotel airport when we returned from our trips to various areas almost two weeks later, JUST as they had arranged. Very impressed! We would highly recommend both this tour AND the company who does it! This was a fun filled day. Our guide, Daniel, was delightful---very personable, very knowledgeable, very accommodating, and he spoke English very well. The drive up to Otavalo was beautiful with a couple of scenic stops along the way. The market in Otavalo is a great place to shop, see the some of the residents in their traditional dress, and observe the crafts of the area. The stop in Cotacachi was also very interesting. Cotacachi a strong North American influence because many ex-pats live there and it is easy to see why. This was a great choice for exploring some of the regions outside of Quito. We had already spent two days in Quito and I'm glad we got to see and learn of some of the areas north of the city. A highlight of our trip that had a lot of great moments. This trip is well worth the cost.Marco is a wonderful guide. Nice day trip from Quito our guide Daniel was very informative. We especially enjoyed the Bizcochos and watching them being made.